The record close for the Nasdaq overnight was just the cue investors needed to send local shares higher yesterday. 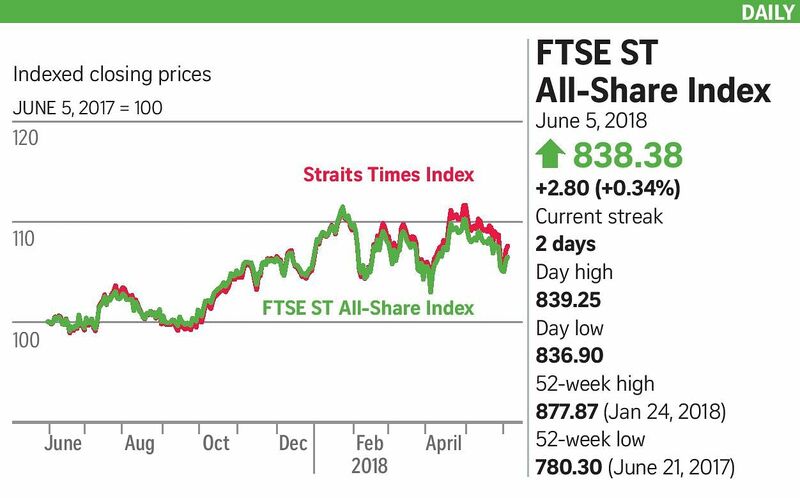 The benchmark Straits Times Index rose 15.68 points, or 0.45 per cent, to 3,483.16, adding onto Monday's 1.2 per cent uptick. About 1.5 billion shares worth $1.1 billion were traded, with losers outpacing gainers 206 to 185. Select blue chips led the way, including DBS, up 32 cents to $29.12; OCBC, up 11 cents to $12.88; and property developer City Developments, which rose 12 cents to $11.48. This came as credit ratings agency Moody's maintained its stable outlook on Singapore banks over the next 12 to 18 months, citing the healthy economy and robust bank fundamentals. "The banking system's strong capital levels, as well as funding and liquidity, indicate that the banks can comfortably support credit growth, which we expect will increase in 2018 to 2019," said Mr Eugene Tarzimanov, Moody's vice-president and senior credit officer, in a statement. Consumer stocks also saw a boost yesterday after DBS Group Research flagged it on Monday as "the only positive sector in May". Indeed, last month, consumer durables led the sector's performance with 3.1 per cent in total returns, trimming its five-month decline to 3.9 per cent. The sector's net institutional inflows of $106 million also represented a monthly record since SGX Research began reporting these flows in January 2016. Genting Singapore rose two cents to $1.28 yesterday after DBS Group Research recommended "buy" on the counter. This was despite news that Japan's integrated casino resorts will likely face more delays as the country struggles to overcome challenges such as local opposition, problem-gambling concerns and low unemployment. ComfortDelGro added four cents to $2.51. Credit Suisse noted late last month that industrials have replaced banks as its most-preferred sector in Singapore. The Swiss bank also has a more bullish outlook for ComfortDelGro, which it believes may see an earnings per share compound annual growth rate of 6.6 per cent from 2018 to 2020 due to easing taxi competition after the Uber-Grab merger and likely tighter regulations. Terminal operator HPH Trust went up 0.5 US cent to 28.5 US cents, while shipbuilder Yangzijiang added one cent to $1.02. Both counters are believed to have bottomed out to the point that value has emerged, DBS said in its Monday report.